Seashell Wave Personalized House Number Plaque - - for your beach house or "I wish I had a beach house" house. Made in USA. 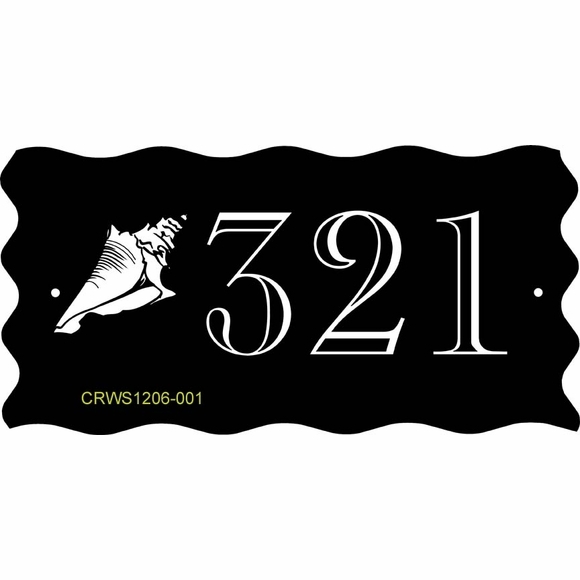 House number plaque features unexpected scalloped edges, stunning two tone numerals, and a detailed seashell logo. Wall mount address sign customized with one, two, or three numbers. Holds up to three (3) 3" characters. Made from sturdy and UV-stabilized laminated acrylic with engraved numbers and logo. Note: The style number you see in the lower left corner of each sample does not appear on your plaque.